Matti has revealed information, that this Luders design (#1054) has originally been built for Mr. Gerwer, in 1965. Given her registration date (1966) in Switzerland being later then the building year (believed to be 1965 or even earlier), the boat was possibly launched for an owner in another country. 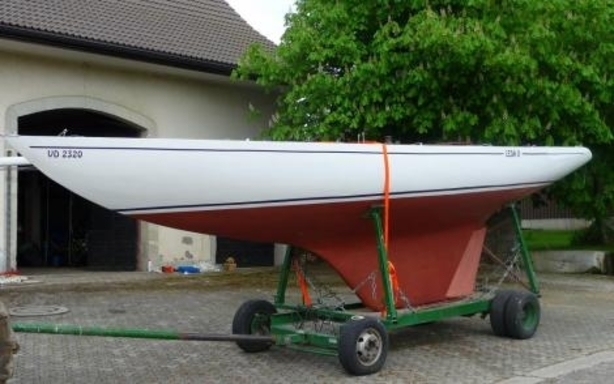 One boat, which is fitting the measurements of "Leda II" is 5.5 USA 53 "Chahala". End of October 2009, I was visiting Jean-François "Bouboule" Burkhalter in his shipyard in Yverdon-les-Bains (south-west end of lake of Neuchatel, SUI), when he told me about his two latest restaurations of 5.5 : SUI-069 "Scatoulitsa IV" and SUI-081 "Leda II". Bouboule showed me some pictures of these two wood-works (his know-how is famous), but we didn't have enough time to go further in these subjects. Anyway, all of these datas are available by contacting him. Just refer to this Inventory research (which has been presented to him).